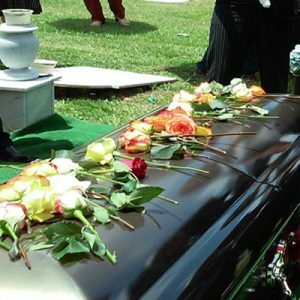 In the first situation, we bring your loved one, in a casket, to the church or place where the funeral sermon will be conducted. The sermon or memorial service will be held as tribute to the loved one. After the sermon or memorial service, the mourners will proceed to the cemetery where a short service can be held before the actual interment takes place. After the interment, the mourners will normally move to a venue where refreshments will be served and the mourners will celebrate the life of the deceased. Alternatively, the mourners will gather at the cemetery or place of interment, have a short sermon and do the actual internment. After the interment, the mourners will move to the church or venue where the actual sermon or memorial service will be held. After the service the mourners will move on to a venue where refreshments will be served and the life of the deceased is celebrated. Viewing of the loved one can take place prior to the burial or on the day of such burial, depending on the religion or tradition of the loved one and the facility where the service takes place.